While Monarchs have been rare this summer, there have been lots of Black Swallowtails around laying eggs in St. Louis. 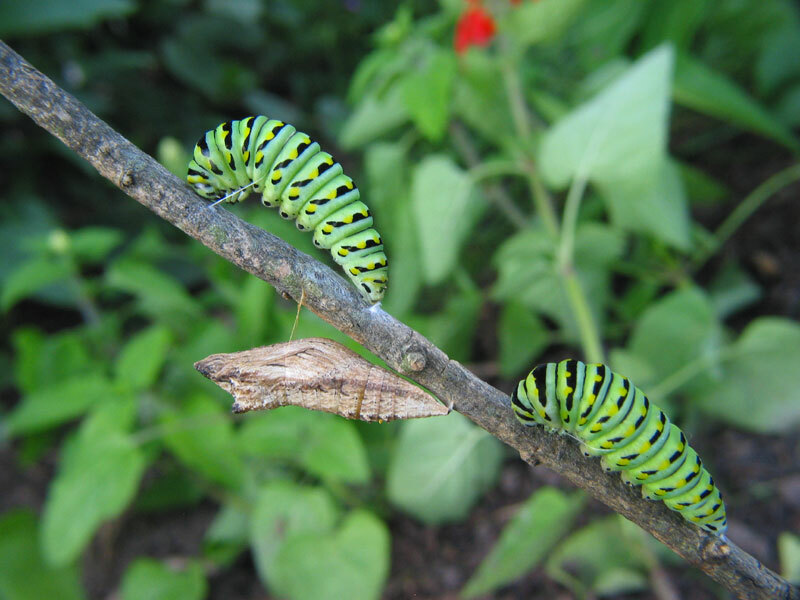 I have personally raised or given away about thirty caterpillars to schools. 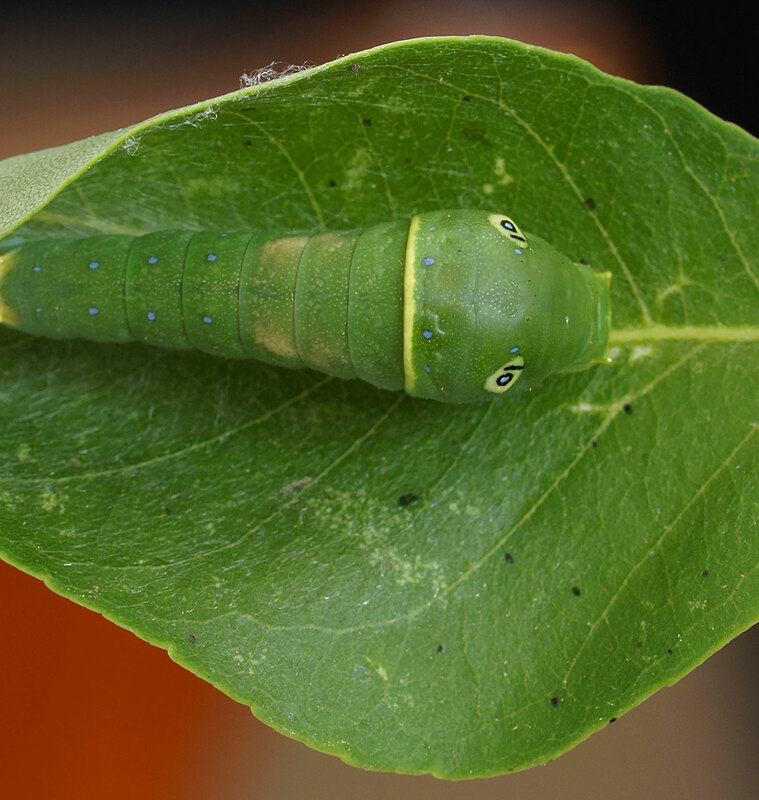 Luckily Black Swallowtails have a wide palette of host plants. These include, bronze fennel (their favorite this year), rue (also good for Giant Swallowtails), Golden Alexander – Zizia aptera, dill. fennel, Parsley, and Queen Anne’s lace. If you see a caterpillar on any of these plants, there’s a good chance it’s a Black Swallowtail. 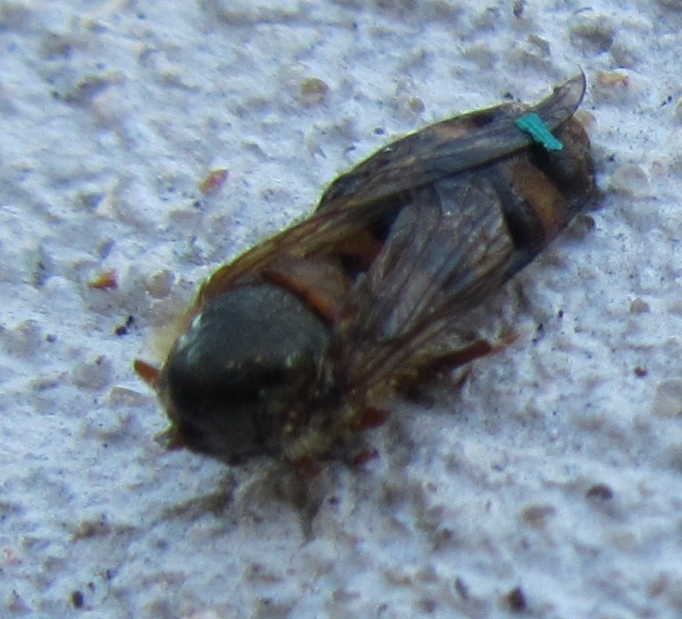 This first picture is a 2nd larvae I just found this morning. For the first time, I’ve had a chance to raise an Eastern Tiger Swallowtail. 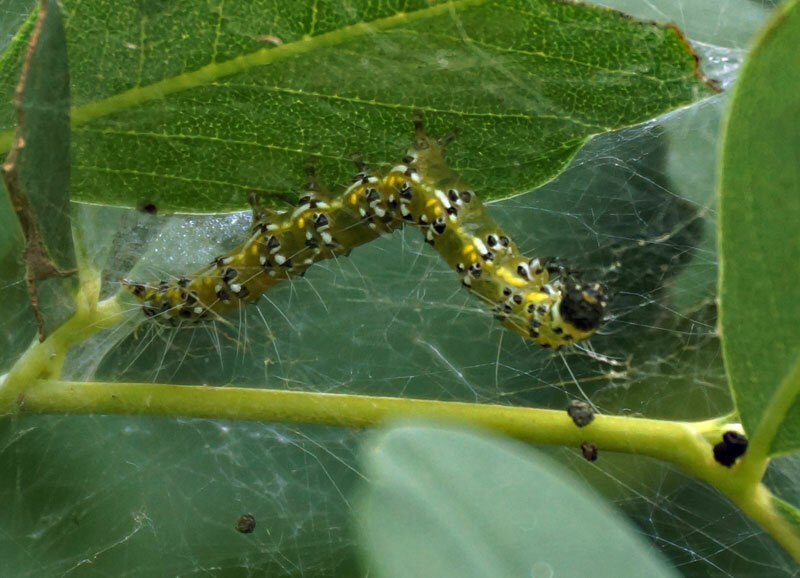 This caterpillar was found on my Hop Tree after I saw a Tiger laying eggs there. It’s getting larger in my enclosed cage and is doing well on Hop Tree leaves. It’s interesting that it is motionless during the day and must thus feed at night. In the early instars it looks like a Giant ST, but changes to all green later. Having eyebrows is a fun touch on its false eyes. 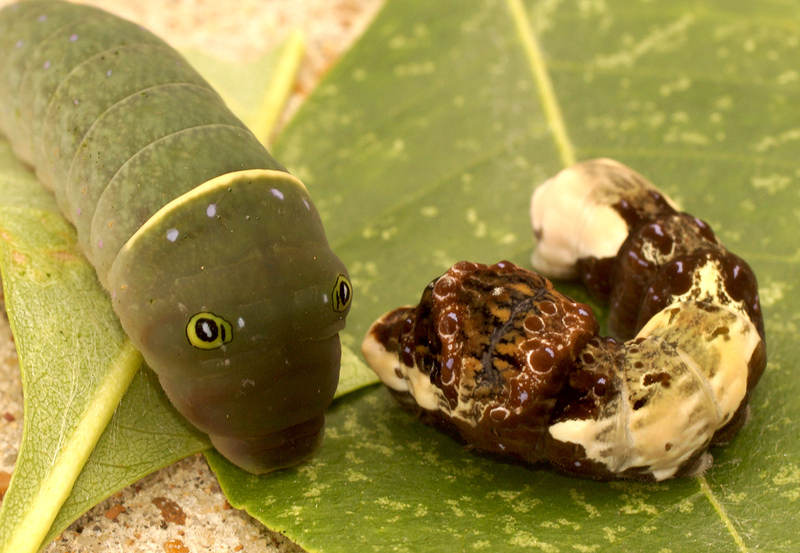 Below is a comparison of the Tiger and Giant Swallowtail larvae together. I have a friend who wants to raise a caterpillar into a butterfly, but obviously didn’t know anything about the process. Here are the basics you need to know. Every butterfly needs a specific plant, called a host plant, on which to lay their eggs. Monarchs will only lay eggs on milkweed; pipevine butterflies use the pipevine plant etc.. In the picture above , it’s a black swallowtail butterfly laying eggs on bronze fennel. 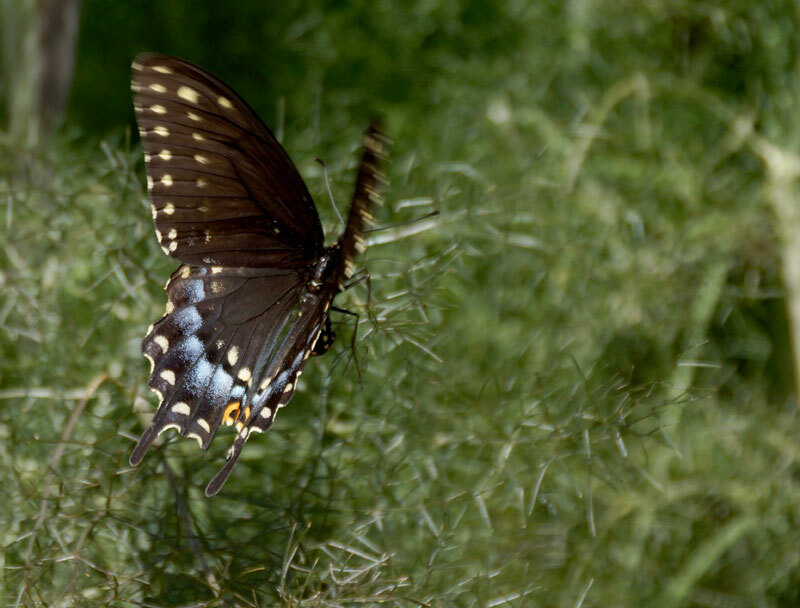 The black swallowtail also uses dill, fennel, parsley plus a few others, so this is a good butterfly to start with. 1. The first thing you need to do is to buy the specific host plant. I particularly like bronze fennel since it’s a hardy perennial. Buy more than one and spread them around your garden so there’s a better chance for the butterfly to lay eggs on multiple plants. 2. 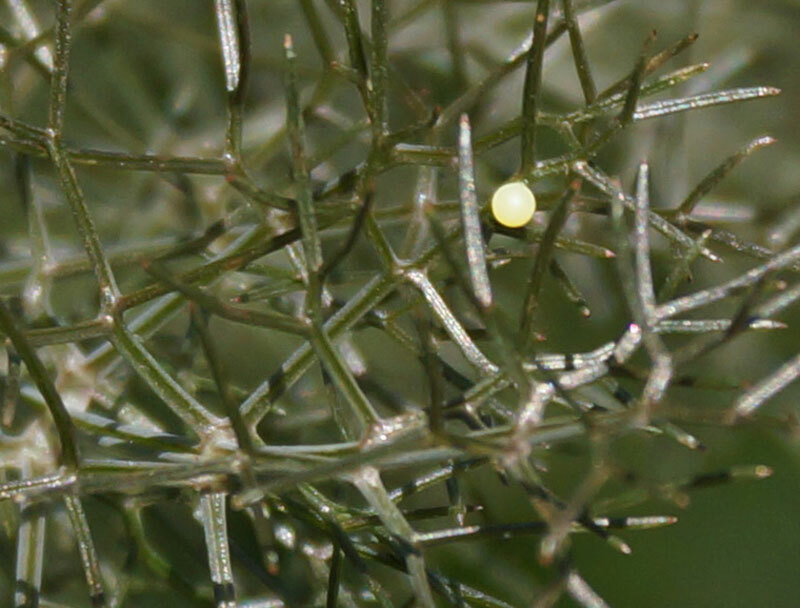 The easiest way to find the eggs is to watch the butterfly flying around your host plant and pay attention to where they stop and lay their eggs. You can also just check the plant every day for eggs. 3. Once you find the eggs, cut off part of the plant and stick it in some water. I like to use empty soda cans. Cut off at the stem so you have something to stick in the water. This technique will keep the leaf fresh, although it will droop for the first day. You will now need somewhere to keep your new eggs and leaves. I like to use a fish aquarium as it’s easy to see what’s going on and easy to clean out. You can literally use anything though. I also like to put newspaper on the bottom of the cage to help in clean up and I also put a piece of cloth over the top to keep out predators like small spiders and wasps. Once your eggs hatch, just keep them supplied with new leaves to eat. I keep the eggs separate from the caterpillars. They might get eaten if they are on the same stem as a hungry caterpillar. I usually keep my fish tank in the garage where it doesn’t get to hot. Obviously a fish tank will overheat in the direct sun. If you have a shady area, you could put it there. but realize it will fill with water when it rains. This does smell a bit, that’s why I don’t keep it inside. 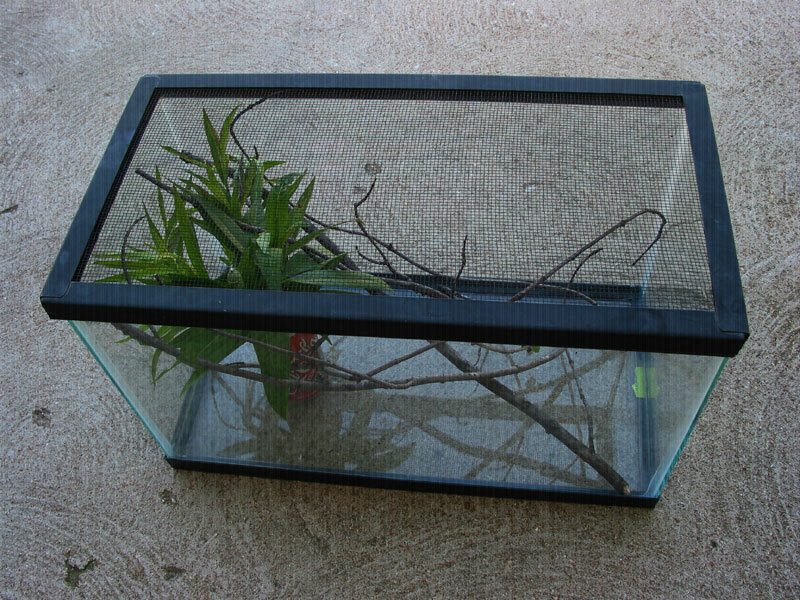 The caterpillars want to wander at this point, so that’s why you need the lid. If you don’t have a lid, your caterpillars will go exploring. I usually put in some sticks for them to use, but usually they climb to the top of the cage and use the wire mesh at the top. 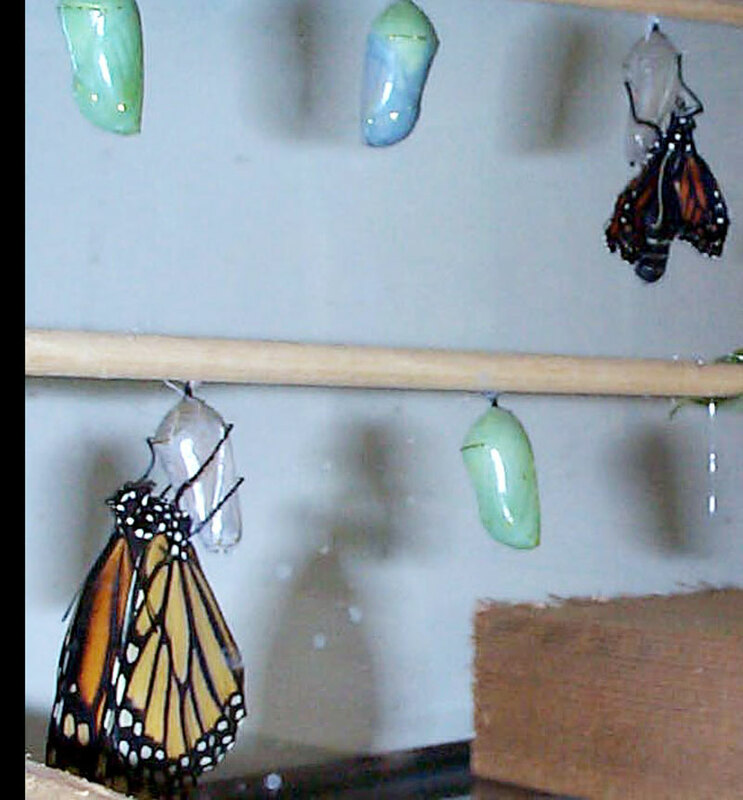 After another week the chrysalis will open and the butterfly will emerge. The picture above shows monarch butterflies. I usually wait 24 hours before I release the butterflies. The whole process takes about a month and is a fun project not only for kids, but adults also. Dave Tylka recently told me about a problem with the Genista broom caterpillar/moth. In some places it is devastating the blue baptisias in some gardens. I just recently noticed this caterpillar and I’m raising one to see what the moth looks like. According to Dave, it only eats the blue baptisia. You can control it with hand picking or BT if you have a lot. Some people have reported losing their plant. Here’s a link from GardenWeb with other people’s experience. I brought a Monarch caterpillar in from the garden thinking I was saving it from a predator. Unfortunately, a predator had already got to it. Below are two pictures of predators. 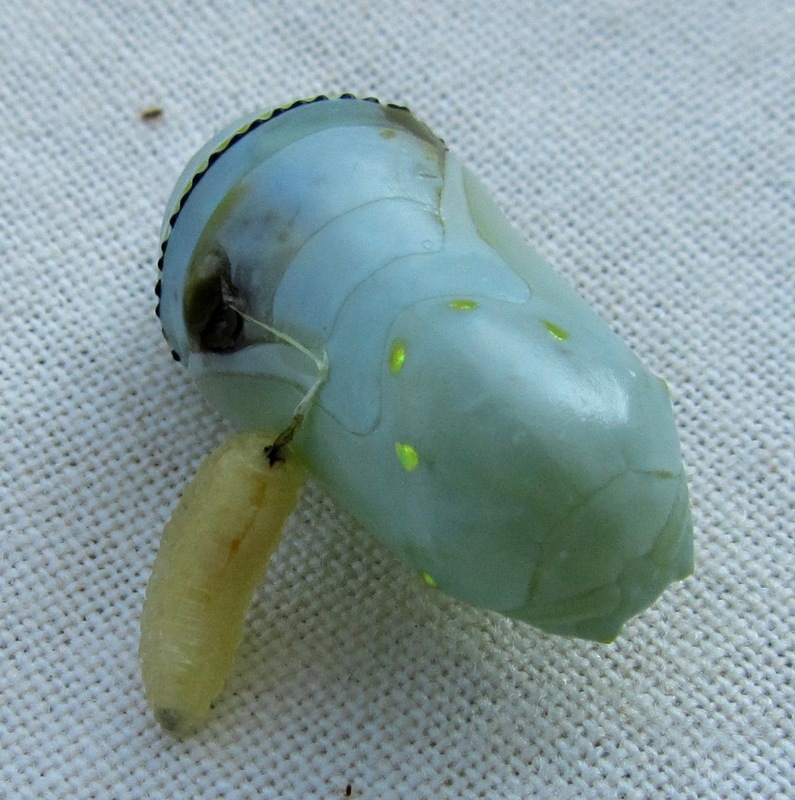 One was on a caterpillar and one was from the chrysalis. 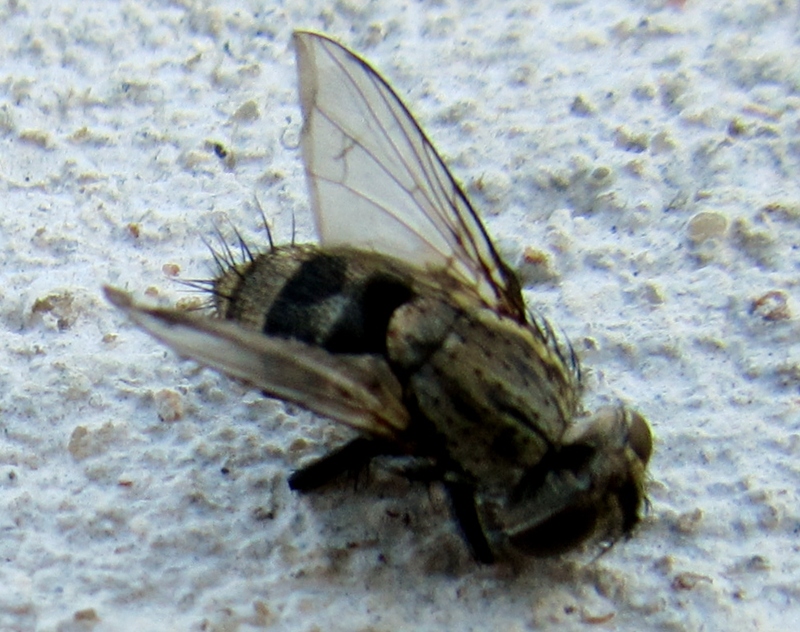 I believe the unusual insect was on the chrysalis and the fly was on the caterpillar. 1000’s of Butterflies – NOT! If you’ve ever wondered why there aren’t 1000’s of butterflies flying around, here’s one of the reasons. Painted Ladies lay eggs on my Pearly Everlasting every year and even though they try to pull the leaves together and use silk to protect themselves, wasps seem to find a way in to get to them. 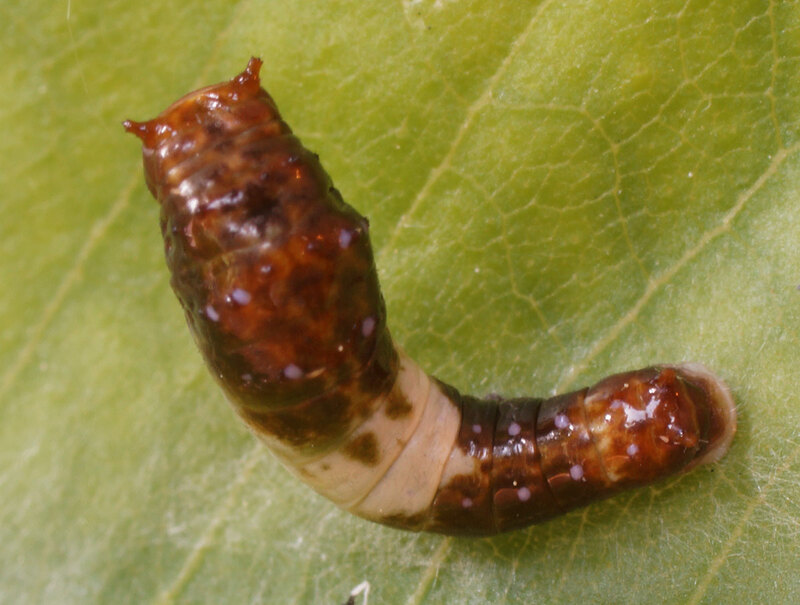 Here’s a picture of a painted lady larva which has become the host for a wasp larva in the white cocoon. 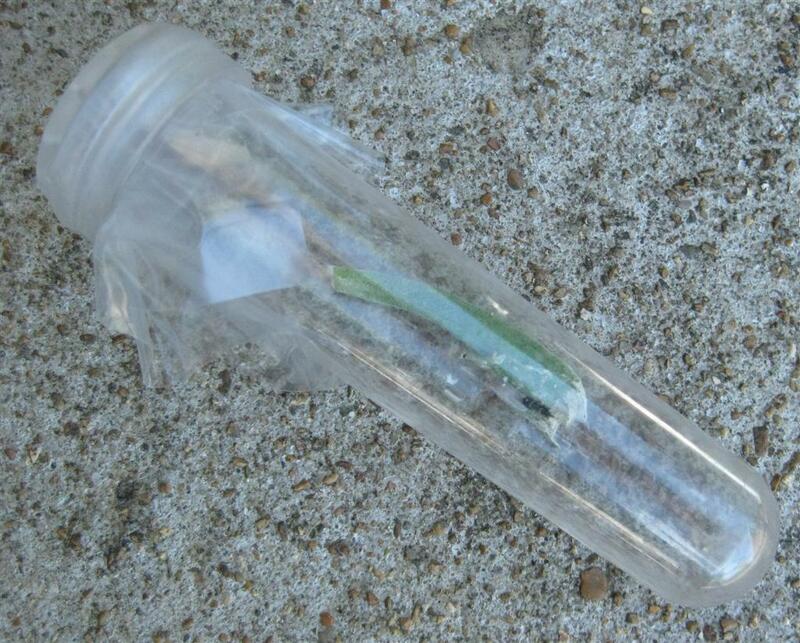 I’m keeping the cocoon in a sealed plastic tube to see what sort of wasp emerges. In the Feb/March issue of Horticulture magazine they made a beginner’s error. 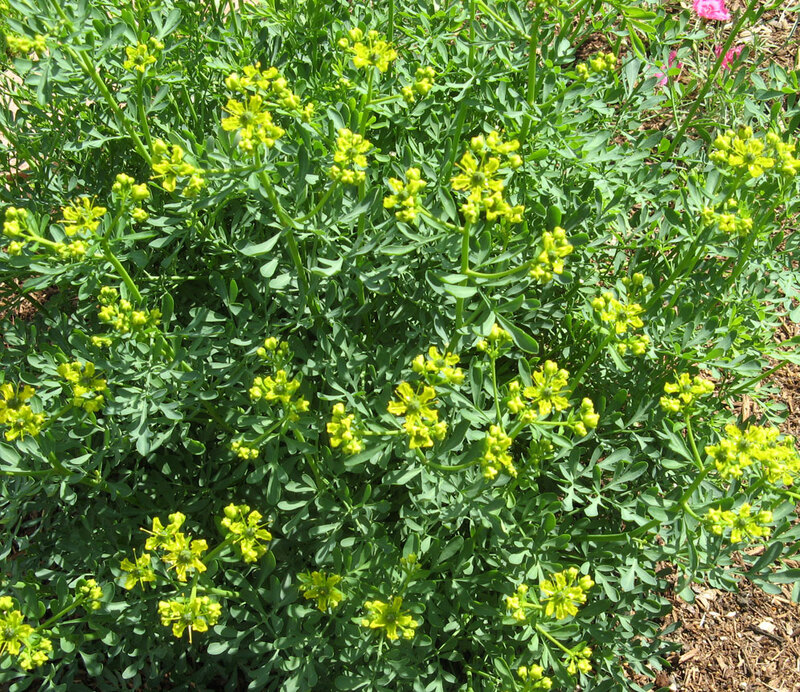 They talked about Rue being a host plant for Black Swallowtails, but then showed a picture of Meadow Rue (Thalictrum), which is nothing like the Rue (Ruta graveolens), Swallowtails are looking for. Make sure you get the right one when you’re at the nursery. Note – rue might give you a rash, but I’ve only had one person tell me that they had a problem with it.